COLORADO SPRINGS, Colo. – The first-ever National Triathlon Week, an initiative launched by USA Triathlon to celebrate the multisport community and all its constituents, culminated on Saturday and Sunday with thousands of multisport athletes participating both on social media and in communities across the country. #TriWeek, which ran from July 17-23, was a social media-based initiative that was also designed to expand the awareness and appeal of triathlon to mainstream audiences. Each day centered around a different theme, including a day for each discipline of triathlon (Swim Day, Bike Day and Run Day), Recovery Day, Member Appreciation Day and Race Weekend. Aspiring triathletes, age-groupers and elites were encouraged to share their multisport experiences online, and prizes were awarded to randomly selected participants who shared questions, advice or inspiring stories using the hashtag #TriWeek. Triathletes were also asked to submit their #WhyDoYouTri stories on social media or via email for a chance to win a USA Triathlon Lifetime Membership. Posts about National Triathlon Week on USA Triathlon’s social media channels garnered more than 6 million impressions. On Member Appreciation Day, age-group triathlete Sue Reynolds was selected as the #WhyDoYouTri contest winner. Reynolds, who weighed 335 lbs in 2012, was motivated to begin a diet and exercise routine to complete her first triathlon. Through her training, she went on to lose 200 lbs — ultimately qualifying for and competing at the 2016 ITU Age Group Sprint Triathlon World Championships in Cozumel, Mexico, as part of Team USA. At the World Championships, Reynolds was the fourth-fastest U.S. athlete in her age group in 11th place. Reynold’s submission was shared on USA Triathlon’s social media accounts, garnering 3,430 likes, 139 shares and 137 comments across Facebook, Instagram and Twitter to date. Several USA Triathlon partners — including ACTIVE, KT Tape, NormaTec, Pearl Izumi, Quintana Roo, Rudy Project, TrainingPeaks and USATStore.com — participated in the weeklong celebrations by offering complimentary training resources and special discounts, launching contests and raffles, and promoting #TriWeek on social media. Many other members of the multisport community joined the festivities, including IRONMAN; the USA Triathlon Foundation; USA Triathlon-certified race directors, coaches and officials; elite triathletes and paratriathletes; collegiate club and NCAA varsity triathlon teams and multisport clubs across the country. 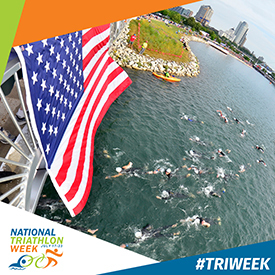 For more information about National Triathlon Week, visit usatriathlon.org/triweek.